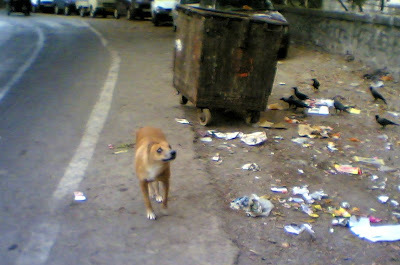 A stray and crows scavenging outside a garbage bin in Mumbai. Books can be written on the lives of these wonderful people living in Mumbai! The Mumbai sky as seen on 28May09 at 1924hrs. Bozo in his childhood, a few days after he was rescued from the streets of Mumbai, romping around, exploring his new territory. 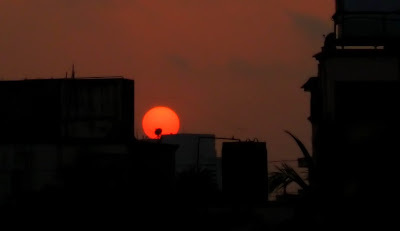 The Setting Sun of Mumbai. 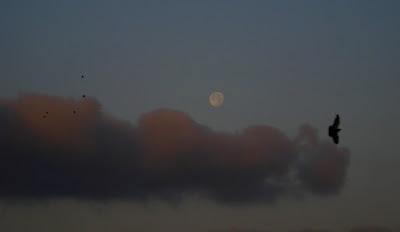 That's my world - of pink clouds in a blue sky with the moon and a bird at 0627hrs on 11May09. 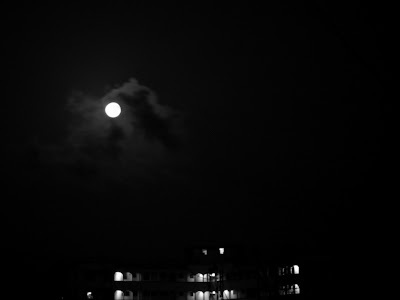 The Mumbai moon in Monochrome as seen on 10May09 at 0538hrs. Seen at the Reception in one of the administrative offices of an airline in Mumbai. My aoplogies for being unable to visit all the fantastic blogs of my visitors in the past 2 days. Am having connectivity problems which should be sorted out in a day or two. Will then ensure visit all those lovely blogs that have been missing so far! The Mumbai sky as seen on 20May09 at 1859hrs. Coconut palms and Gulmohur trees are very popular in Mumbai. Bozo refelecting on the day's events. An upwardly mobile 'slum'. Spot the airconditioning unit on the roof of the 'cool slum'. A participant at the Mumbai marathon. The Mumbai crow in flight. Painted by God in the Mumbai skies on 31Mar09 at 1850hrs. The Mumbai sky as seen on 11May09 at 0609hrs. Mumbai - the city that can only grow vertically now. This is in Prabhadevi, near Worli, Central part of Mumbai. The Quintessential Mumbai sky with the clouds, the birds and the moon bathed in the early morning sunlight. The Brihanmumbai Municipal Corporation has intoduced these mini garbage dumpers/compactors to ensure that even the narrow bylanes can have their garbage cleared conveniently. 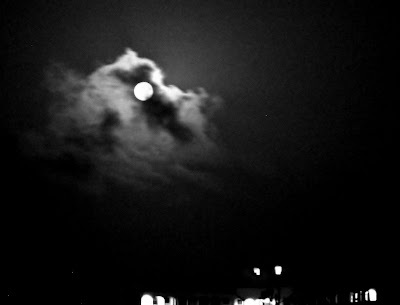 The Mumbai moony sky in Monochrome as seen on 10May09 at 0537hrs. 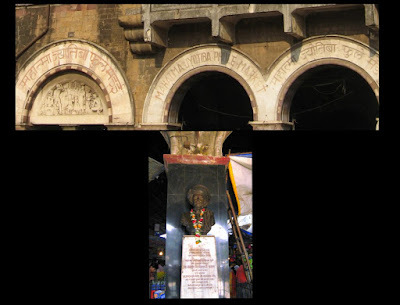 Crawford Market (officially Mahatma Jyotirao Phule Market) is one of South Mumbai's most famous markets. It is named after Arthur Crawford, the first Municipal Commissioner of the city. The market is situated opposite the Mumbai Police headquarters, just north of Victoria Terminus railway station and west of the J.J.flyover at a busy intersection. The market houses a wholesale fruit, vegetable and poultry market. One end of the market is a pet store. Most of the sellers inside the market nowadays sell imported items such as foods, cosmetics, household and gift items. It was the main wholesale market for fruits in Mumbai until March 1996, when the wholesale traders were relocated to Navi Mumbai (New Bombay). The building, completed in 1869, was donated to the city by Cowasji Jehangir. After India's independence, the market was renamed after Maharashtrian social reformer, Mahatma Jyotirao Phule, whose statue is placed at the entrance. In most parts of Mumbai the Gulmohar trees are in full bloom. I think they are also called May flowers. This is the ubiquitious pao of Mumbai. A fast food mainstay to be eaten with a lot of savories or in the old Irani restaurants would be eaten with a dollop of butter and chai. That is my world - Mumbai - a city full of sharp contrasts. Slums amid buildings. Trees amidst concrete. A result of overcrowding, poverty and success. A city throbbing with opportunities. Navi Mumbai (New Mumbai) an extension of Mumbai - a city that was built to decongest Mumbai. This cute little bird came and sang for me yesterday. Unfortunatley I could not get a very clear picture. Please excuse the blur. Am not a birder so do not know the name. 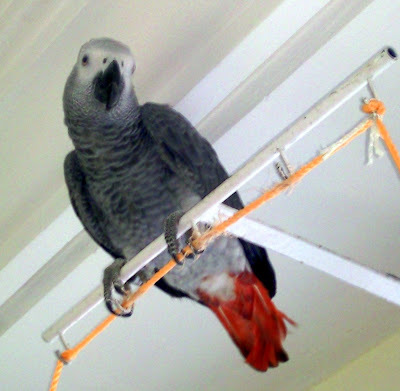 It has a fan tail and trills beautifully.